Will Allen didn't set out to become a food industry revolutionary -- he just wanted to open a roadside stand to sell fresh produce from his small hobby farm. 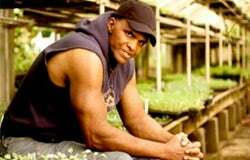 But this former professional basketball player soon transformed a 2-acre lot with ramshackle greenhouses into a beacon of good food and hope amid the nutritional wasteland of convenience stores and fast-food restaurants in inner-city Milwaukee. What started out as Will's Roadside Farm Market has evolved into Growing Power, a nonprofit organization dedicated to promoting urban farming and sustainable food practices across the nation and around the globe. "We're a work in progress," Allen says in an interview with SecondAct.com. "Farming is always a work in progress." Allen's new autobiography, The Good Food Revolution, chronicles his unexpected journey from ABA basketball player to Procter & Gamble marketing executive to urban farm activist. "The book traces the legacy of my family all the way up to what we're doing today, and it has a lot of historical things about agriculture in it," says Allen, who received a MacArthur Foundation "genius" grant in 2009. "My family has been in agriculture for 400 years or more. My family, like many families, migrated to the north. "My book talks about the Great Migration, the loss of African-American farmers. But it's more than just an illustration of my family. It's also about the people I work with and their challenges, and it even covers some of the future of where we're going." The 63-year-old farmer has traveled the world to bolster urban agriculture efforts. He admits he wasn't always so enthusiastic about farming. He resented it as a child. "As a young man, I felt ashamed of my parents' sharecropping past," Allen writes in his book. "I didn't like the work of planting and harvesting that I was made to do as a child. I thought it was hard and offered little reward. I fought my family's history. Yet the desire to farm hid inside me." That desire germinated when he was playing basketball in Europe in the early 1970s after his stint in the ABA. He encountered farmers at open-air markets and then visited their pesticide-free farms; that inspired Allen to plant his first garden. "At almost every Belgian garden, I saw wooden compost bins. My father taught me as a boy how to compost," he recalls. Composting became even more important after he purchased his own farm in 1993. "We have to grow new soil because a lot of our soil is contaminated, and every major city needs a major composting opportunity," Allen says. Good soil leads to good food, and access to good food is a social justice issue. "Without sustainable food systems, urban areas will never become sustainable societies," he says. Initially, when Allen began fixing the leaky greenhouses and rebuilding the soil on his land, he invited local residents, especially older children and teens, to help him farm. His informal mentorships blossomed, and soon local nonprofits began asking Allen to teach them about farming, and Growing Power sprouted. Growing good soil and growing healthy food remain Allen's top priorities. This spring, Growing Power will open its first inner-city café and grocery in Milwaukee, near the city's north side. The nonprofit organization is working to add more than 20,000 community and backyard gardens in Southeast Wisconsin before the year's end. Growing Power also plans to hire more than 100 employees to staff 15 regional training centers across the country to train urban farmers. In September, Allen and his group expect to train thousands more at the second annual National-International Urban & Small Farm Conference in Milwaukee. But every time Allen achieves a goal, he inevitably sees another problem that needs to be addressed, and he says he sets another, even higher, goal. His latest mission is to transform Growing Power's Milwaukee headquarters into the world's first vertical farm. The five-story greenhouse and conference center hasn't yet been constructed -- it's still wending its way through the city planning process, and construction funds still are being raised -- but Allen says he is confident it will happen. "I hope this building will provide a legacy that will ensure the survival of my organization and its mission when I am gone," he writes in his book, which is co-authored by Charles Wilson. More than any building, Allen's legacy is the social change of helping move farms closer to people, the way it was a century ago, when cities boasted dozens of small farms and gardens. More and more people are joining "the good food revolution," Allen says, but not every revolutionary has staying power. "My biggest challenge is to make sure that the people who get into this are people who will stay into it," Allen says. "People love the movement of a revolution, but they actually have to become passionate about it to stay in it. That takes time." 1. He doesn't watch television, but he loves listening to music. "I'm stuck in the '70s," Allen says. "I'm a Motown kind of guy, and I listen to CDs in my car as I drive from farm to farm. That's the only time I have to listen." 2. Every morning he fishes at a pond by his farm. "I do the catch-and-release thing," Allen says. "Fishing and farming were two of the things my father passed on to me. I know how to take care of myself, and I'm pretty self-sufficient." 3. He's a great cook. "If you're going to eat, you need to learn how to cook," Allen says. "I am known for my stir-fried collards, the way I fix fish and chicken, and my sweet potato pie. And, of course, greens. I make my own salad dressings, which is basically vinegar and oil. I use two parts oil to one part balsamic vinegar with some honey, add a little salt and pepper, squeeze a little garlic in and we're good to go. The more greens you use in your salad, the better the taste. That's what I eat. Sometimes I'll eat a whole plate of nothing but greens, cucumbers, tomatoes and onions."